©Dykes W-517 baseball card photo courtesy of Bill Spigler, Waynesboro, PA.
Did you know professional baseball once took the limelight along the northern region of the Blue Ridge Mountains? From 1915 to 1918, and 1920 to 1930, the Class D, Blue Ridge League flourished in the communities of Hagerstown and Frederick, in Maryland; Martinsburg, West Virginia, and the Pennsylvania towns of Hanover, Chambersburg and Waynesboro. At one time the far Western Maryland communities Cumberland and Piedmont, and Gettysburg, PA were also were members of the league. Over the years they were known as Hustlers, Maroons, Blue Sox and Red Birds. Dry Bugs, Colts, Terriers and Ponies. They had nicknames like "Lefty", "Babe", "Hack", "Chick", "Bugs", "Rube", "Snooks", "Dutch" and "Shorty". They played for the love of the game, and the outside chance someone might see them for a chance to tryout for one of the nearby Major League teams in Washington, Philadelphia, Pittsburgh, or at least a chance to move up to a higher class league. The names Connie Mack, Clark Griffith and Jack Dunn were revered by the players and team owners in the league, who were known to send players to each of the league teams throughout the league's history. The league produced three Baseball Hall of Famers: Pitcher Robert Moses "Lefty" Grove; outfielder Lewis Robert "Hack" Willson; and umpire Bill McGowan. 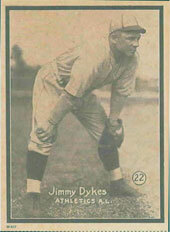 It also produced several well known Major League players and managers, such as Jimmy Dykes (pictured), Johnny Neun, Luzerne "Lu" Blue, Clyde Barnhart, Bill Sherdel, Bill Lamar, Herb Thormahlen, Marvin Goodwin, Clarence Blethen, Rollie Hemsley, Roger "Doc" Cramer, Joe Vosmick and "Babe" Phelps. Based in Hagerstown (MD), the Class D, Blue Ridge League (BRL) was part of the National Association of Professional Baseball Leagues (NAPBL), now known as The Minor Leagues. The league was founded by Charles W. Boyer, a former league president in the original South Atlantic League, in 1915, who served as league president of the BRL in 1915. Due to a conflict of interest, Boyer resigned as president the first week of the 1916 season, and James Vincent Jamison, Jr., a Hagerstown businessman, was named to replace Boyer as league president. Jamison would become one of the most respected league officials of his era, and serve as the BRL's only other league president, until the league disbanded for good after the 1930 season. To find out more about the Class D, Blue Ridge League, please click onto the History link, and then click on one of the highlighted years to find out more about the league, and the players who played in the BRL. Check out our Pictures page for new information! The goal of this website is to continue the legacy of the original Class D, Blue Ridge League (1915-18, 1920-30), and remember those players and officials who played an important role of bringing the excitement of professional baseball to the Western Maryland, Eastern Panhandle of West Virginia, and South Central Pennsylvania during a almost forgotten time in our history. We respect the intellectual rights of our fellow researchers, and ask that if you use anything from this site that it is properly credited, whether from the author (read below), or a third party. Though we respect the privacy of the families of these players and officials, we hope this site can remember some of them for their accomplishments on or off the field. If you use any content or pictures from this website please include any copyrights to www.blueridgeleague.org © Mark C. Zeigler, Boys of the Blue Ridge, 2002-2006. We are not responsible for any copyrights on any third party photographs (i.e. - Baseball Hall of Fame Library, University of Maryland, Philadelphia Athletics Historical Society, et al), and do not hold the copyright outside of this website, and our upcoming publication, "Boys of the Blue Ridge - The Early Years." Disclaimer: This web site has no connection to Major League or Minor League Baseball or any of its affiliated franchises. The information contained herein is factual, and has been researched through the archives of many newspapers, especially in the areas of the Blue Ridge League cities and towns. Special thanks to Ken Malnar, Nikoletta Benami and Andy Smith of 270net.com, Frederick, Maryland; Mary Mannix and Maryland Room of the C. Burr Artz Library, Frederick, Maryland; Mary Jo Price of Frostburg State College, Frostburg, Maryland; John Frye, Western Maryland Room, Washington County Free Library, Hagerstown, Maryland; www.newspaperarchives.com; ProQuest; the Baseball Hall of Fame Library, Bert Giamatti Research Center, Cooperstown, NY; Philadelphia Athletics Historical Society, Philadelphia, Pennsylvania; www.vintageball.com, Frank Russo and www.thedeadballera.com; and the Society of American Baseball Research, Cleveland, OH, and its members.